New Tool Added to the Learning Service Library! Over the years, we at Learning Service have been inundated with requests to help potential volunteers to find an ethical, effective volunteer placement, that fits their needs, skills and values. Our response has always been that there is no shortcut for doing your own research and for taking the time to thoroughly evaluate the options. With the release of the Learning Service book, we finally have a resource that lays out our suggested process for finding a way to do good in the world, either through volunteering or by taking other action in their life. However we are still finding that some people want a little more detail on exactly HOW to evaluate volunteer opportunities. Therefore, we are introducing the Learning Service Research Assessment Tool! It is packed full of topics and questions that you may want to find out about a volunteer placement. 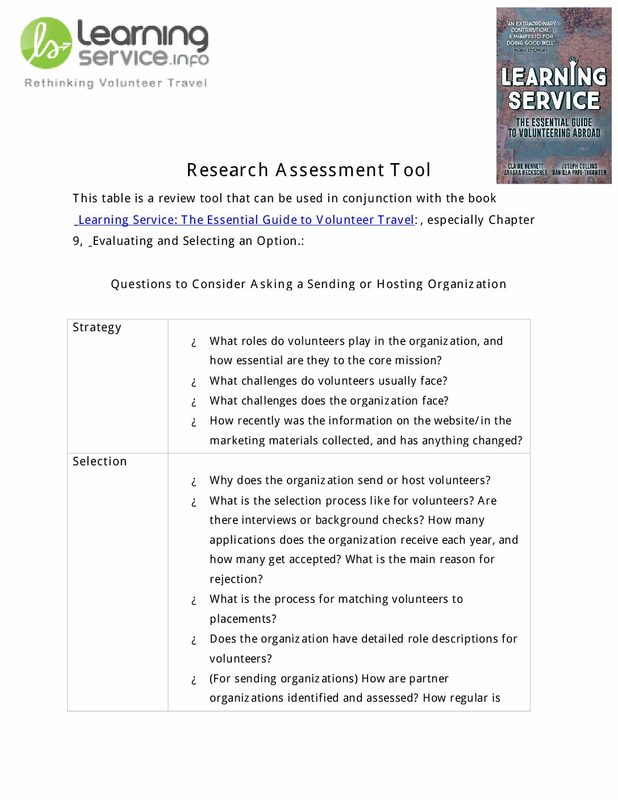 The tool is designed to be used alongside Chapter 9 of the Learning Service book. As we advise in there, please don’t just email this whole list of questions to a volunteer provider! Many of the answers can be found in other ways – on their website or social media pages, on review sites, in the news, on volunteer blogs, or by contacting previous volunteers. To find the tool, log in to the Library and click the farthest right image (first page pictured here). We hope it is useful to you! Please write to us with your experiences, feedback or suggestions.